We have discovered a bacterial strain Pseudomonas species X11 that produces the unique restriction endonuclease PspXI. This enzyme recognizes the degenerate octanucleotide sequence 5’-VCTCGAGB-3’, where V stands for A, C or G and B stands for T, C or G. The PspXI restriction endonuclease preparation with the specific activity of 10000 units/ml was isolated using four chromatographic steps. PspXI cuts its recognition sequence between C and T producing cohesive ends compatible with those of produced by XhoI and SalI restriction endonucleases. Type II restriction endonucleases (ENases) are the bacterial enzymes that recognize specific short sequences on double-stranded DNA. These enzymes are widely used in molecular biology and genetic engineering experiments. At present more than 200 ENases with different specificities have been discovered. But only 27 of them recognize the sites consisting of more than six nucleotides . Some of ENases recognize more than one variant of the sequence, i.e. degenerate sequence. Here we describe a novel restriction endonuclease, PspXI, isolated from the bacterial strain Pseudomonas species X11. This enzyme recognizes DNA sequence with unusual, V-B type, of degeneracy. The strain Pseudomonas .species X11 used in this work was from the bacterial strain collection of SibEnzyme Ltd. (Russia). P.species X11 cells were grown at 30°C in a 20 litre fermenter (New Brunswick Scientific, USA) in LB medium (1% Tryptone, 0.5% Yeast extract, 0.5% NaCl, (pH 7.6)), supplemented with 0.1% MgSO4 and 0.001% Thiamine (B1). The culture was grown for 5 hours with aeration at 10 l/min and stirring at 200 rpm up to A550=4. The cells were collected by centrifugation at 3,000 g for 30 min. The biomass yield was 114 g with the PspXI restriction endonuclease activity of 5,000 u/g. The substrate for enzyme activity assay was bacteriophage lambda DNA (digested with HindIII). All purification steps were carried out at 0-4°C. Frozen cell paste was thawed with 400 ml of Buffer A (10 mM Tris-HCl (pH 7.5), 0.1 mM EDTA, 7 mM 2-mercaptoethanol) and disrupted by sonication on the ultrasound desintegrator Soniprep 150 (MSE, UK) using twenty 1 min impulses with 1 min interval. Cell debris was removed by centrifugation at 12,000 g for 30 min. PspXI restriction endonuclease was then purified from the supernatant in four consecutive chromatographic steps using the following resins: 100 ml of PhosphoCellulose P11 (Whatman, UK), (4.5 x 15 cm column), 30 ml of DEAE-cellulose (Whatman, UK) (2.5 x 9 cm column), 7 ml of Heparin-sepharose (Sigma, USA) (1.6 x 8.5 cm column), and 5 ml of Hydroxyapatite (BioRad, USA) (1.6 x 8.5 cm column). Further the enzyme was concentrated by dialysis against the Buffer A containing 0.2 M KCl and 50% glycerol. A total of 12 ml of PspXI preparation with the specific activity of 10,000 u/ml were isolated. PspXI restriction endonuclease preparation was stored at - 20°C. We carried out some experiments to determine the reaction conditions for PspXI restriction endonucleasee action. The optimal reaction conditions for PspXI ENase catalyzed cleavage were found to be: SE-Buffer 5(Y) - 33 mM Tris-acetate (pH 7.9), 10 mM Magnesium-acetate, 66 mM Potassium-acetate, 1 mM DTT, and temperature 37°C (data not shown). Complete inactivation of the enzyme in the reaction mixture was achieved by incubation at 80°C for 20 min. To determine the sequence specificity of PspXI restriction endonuclease the bacteriophage lambda and some plasmid DNAs were used. The patterns of bacteriophage lambda or pBluescriptSK(+) (pBS)  DNAs cleavage with PspXI have shown that recognition site of the novel ENase coincided with that of XhoI and its isoschizomer Sfr274I  (Figure 1A). Bacteriophage lambda DNA has a single Sfr274I recognition site (at position 33498), and in the case of double digestion with PspXI and HindIII restriction endonucleases a fragment 3397 bp in length has appeared. The pBS DNA has a single Sfr274I site, too (at position 667). As is shown on Figure 1A a double digestion of both these substrates with PspXI and Sfr274I ENases does not result in the appearance of additional fragments. A. Bacteriophage lambda and pBS DNAs digested with Sfr274I and PspXI. Lambda DNA/HindIII (lane 2); lambda/HindIII digested with Sfr274I (lane 3); lambda/HindIII digested with PspXI (lane 4); lambda/HindIII digested with Sfr274I and PspXI (lane 5). pBS DNA (lane 6); pBS digested with Sfr274I (lane 7); pBS digested with PspXI (lane 8); pBS digested with Sfr274I and PspXI (lane 9); 0.25-10 kb DNA molecular weight markers (lanes 1 and 10). Digestion products were separated on a 0.8% agarose gel. B. Ad-2 and pMTL22 DNAs digested with Sfr274I and PspXI. Ad-2 DNA (lane 1); Ad-2 digested with Sfr274I (lane 2); Ad-2 digested with PspXI (lane 3); Ad-2 digested with Sfr274I and PspXI (lane 4). pMTL22 DNA (lane 5); pMTL22 digested with Sfr274I (lane 6); pMTL22 digested with PspXI (lane 7); 0.25-10 kb DNA molecular weight markers (lane 8). Digestion products were separated on a 0.8% agarose gel. At the same time the patterns of Adenovirus-2 (Ad-2) or pMTL22  cleavage with PspXI differed from those of Sfr274I (Figure 1B). Sfr274I restriction endonuclease recognizes six sites on Ad-2 DNA (at positions 5777, 8243, 9688, 19330, 23923, 29787) and a single site on pMTL22 (at position 176), while PspXI does not cut pMTL22 and recognizes only three sites on Ad-2 (at positions 5777, 8243 and 29787). Thus, PspXI appears to cut at Sfr274I sites, but it does not recognize all of them. Therefore we examined all possible combinations of nucleotides surrounding the Sfr274I recognition sequence CTCGAG, using PspXI digestions of the additional DNA substrates. Besides above-mentioned we used pSse9/1 , pMT440  as well as pCPV13 (comprising the 1999161-209975 region of cowpox virus)  plasmid DNAs. The results summarized in Table 1 demonstrate that PspXI does not cleave XhoI sites with adjacent T at the 5' end or A at the 3' end. Thus we concluded that PspXI recognized the degenerate octanucleotide sequence 5'-(A/C/G)CTCGAG(T/G/C)-3' or 5'-VCTCGAGB-3' using standard nomenclature. Table 1 The sequences that are cleaved or not cleaved by PspXI. Nucleotides surrounding the internal site CTCGAG are in boldface. DNA substrates and site loCations are shown in brackets. To determine the PspXI restriction endonuclease cleavage position we used two α-32P-labelled double-stranded oligonucleotides comprising CTCGAG sequence. Only one of them comprised a PspXI recognition site (Figure 2). Both oligonucleotides were digested with PspXI or Sfr274I restriction endonucleases. The reaction mixtures were loaded onto 20% polyacrylamide gel and subjected to electrophoresis in the presence of 7M urea. The results presented in Figure 2 demonstrate that the cleavage position of PspXI restriction endonuclease coincided with XhoI one in the case of CCTCGAGT site, while the sequence ACTCGAGA was not cleaved by PspXI. Figure2. Determination of PspXI cleavage position using α-32P-labelled oligonucleotide duplexes. To confirm this result an additional method of cleavage position determination for PspXI restriction endonuclease was used. It is based on sequencing of pBluescriptSK(+) DNA previously digested with PspXI. The resulting fragment was sequenced on the automatic DNA sequencer ABI Prism 310 Genetic Analyzer (Applied Biosystems, USA) according to the manufacturer's instructions. In this case DNA polymerization stops in the breakage position at the bottom strand. Thus, the sequencing data presented in Figure 3 confirm that the novel enzyme cuts its recognition sequence between C and T residues, producing the cohensive ends compatible with those of produced by XhoI and SalI restriction endonucleases. Figure 3. Determination of PspXI cleavage position using sequencing on the ABI Prism 310 Genetic Analyzer. It should be noted that one unusual isoschizomer of XhoI, PaeR7I, has already been discovered earlier. This enzyme does not cut the sequence CTCTCGAG (8). PspXI differs from PaeR7I by its inability to cleave any XhoI site in the nucleotide sequence TCTCGAG. According to REBASE data PspXI is the only known enzyme that recognizes DNA sequence with V-B type of degeneracy (1). We believe PspXI may be considered as a possible evolutionary intermediate between enzymes recognizing six and eight base pairs long nucleotide sequences. We thank Vladimir Baymak for technical assistance in the experimental work and Dr. Alexey Gordadze for critical reading of the manuscript. Roberts,R.J., Vincze,T., Posfai,J. and Macelis,D. (2003) REBASE: restriction enzymes and methyltransferases. Nucleic Acids Res., 31, 418-420. Short,J.M., Fernandez,J.M., Sorge,J.A. and Huse,W.D. (1988) Lambda ZAP: a bacteriophage lambda expression vector with in vivo excision properties. Nucleic Acids Res., 16, 7583-7600. Puchkova,L.I., Krivopalova,G.N., Andreeva,I.S., Selina,A.V., Serov,G.D., Rechkunova,N.I., Degtyarev,S.Kh. (1990) Streptomyces fradiae is the producer of the restriction endonuclease Sfr274I. Izv. Sib. Otd. Akad. Nauk SSSR, 1, 32-34. Chambers,S.P., Prior,S.E., Barstow,D.A. and Minton,N.P. (1988) The pMTL nic- cloning vectors. I. Improved pUC polylinker regions to facilitate the use of sonicated DNA for nucleotide sequencing. Gene, 68, 139-149. Gonchar,D.A., Wolf,Y.I. and Degtyarev,S.Kh. 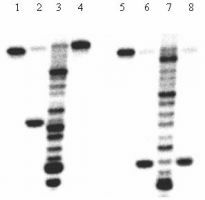 (1996) Cloning and characterization of Sse9I DNA-methyltransferase recognizing 5'-AATT-3'. Nucleic Acids Res., 24, 2790-2792. Deyev,S.M., Yazynin,S.A., Kuznetsov,D.A., Jukovich,M. and Hartley,R.W. (1998) Ribonuclease-charged vector for facile direct cloning with positive selection. Mol. Gen. Genet., 259, 379-382. Shchelkunov,S.N., Safronov,P.F., Totmenin,A.V., Petrov,N.A., Ryazankina,O.I., Gutorov,V.V. and Kotwal,G.J. (1998) The genomic sequence analysis of the left and right species-specific terminal region of a cowpox virus strain reveals unique sequences and a cluster of intact ORFs for immunomodulatory and host range proteins. Virology, 243, 432-460. Gingeras,T.R. and Brooks,J.E. (1983) Cloned restriction/modification system from Pseudomonas aeruginosa. ProC. Natl. Acad. Sci. U. S. A., 80, 402-406.